Supplies: 20 small googly eyes, 10 small neon-colored pom-poms, craft glue, 20 black pipe cleaners, neon-colored pony beads, 10 bright-colored Tootsie Pops. How-To: Glue two eyes onto each pom-pom. Cut pipe cleaners in half, and group together by fours. 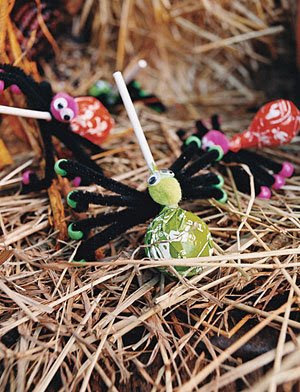 Wrap each group of four pipe cleaners around a Tootsie Pop just below the candy to create eight legs. Press a pony bead into the end of each pipe cleaner to make feet. Glue a pom-pom spider face onto the pipe cleaners at the base of the pop.